A word commonly meant to refer to either the photocopy of a document page or the act of making a photocopy. Xerox itself is a trademarked name of a brand of copying machines that became ubiquitous in office environments in the 1960s. Before it was a trademark, however, xerox was a neologism meant to refer to a new way of reproducing images using electrically charged colored particles: xerography. In Greek, "xero" means dry and "graphy" means writing. 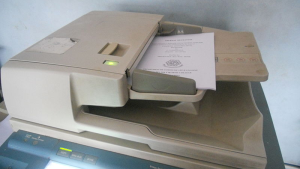 "Duplex Automatic Document Feeder Photocopier, October 23, 2011" by Guruleninn is licensed under CC BY-SA. Globalization. Toronto: University of Toronto Press.